CNC Software, Inc., developers of Mastercam, the world’s leading CAD/CAM software, is partnering with Harvey Performance Company. Through its leading cutting tool brands Harvey Tool and Helical Solutions, Harvey Performance Company provides world class products, services, and solutions that increase productivity for the most advanced customers in the manufacturing and metalworking industries. “CNC Software is proud to partner with Harvey Performance. 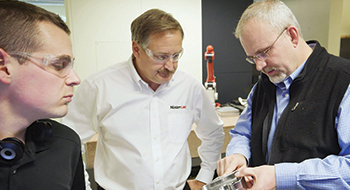 Working with an industry leading tooling company like Harvey Performance allows us to continue to advance manufacturing technology on both the tooling and CAM side of development,” says Stas Mylek, Partner Program Manager, CNC Software, Inc.
Due to this partnership, toolpaths within Mastercam will now be able to integrate Harvey Performance Company’s breadth of tool options. For example, a new “Deburring” toolpath was released in Mastercam 2019 which will allow Mastercam programmers to leverage the strong line-up of Harvey Tool deburring tools. Harvey Tool, a brand known for its specialty profile and miniature tooling, and Helical Solutions, known for its line-up of material specific high performance end mills, offer many other areas for the teams to collaborate on improving end user experiences with Mastercam.